Black Butte Ranch is continuing the Cow Patty Crit race series with a race on February 7, and one on March 14. Blazin Saddles and Black Butte Ranch bring riders further installments of the Cow Patty Crit, They provide four fat bikes for each race, and riders provide the power and gusto. The course will be designed to inspire anyone to give it a whirl (so it won't be too tough). Expect stairs, ramps, logs, tight corners, and cyclocross-style barriers. The course will be set up in a field near Big Meadow Golf Course. Prizes will be up for grabs for each category from Blazin Saddles Bike Shop and Black Butte Ranch. Online registration, $15, closes Thursday, February 5, at 11:59 p.m. Register at https://ultrasignup.com; search "Cow Patty Crit." Or register for $25 on the day of the race from 10 to 11 a.m. Races begin promptly at noon. A warming fire will be provided for participants and spectators. Beverages (including beer and hot chocolate) will also be for sale at the site. Competitors should wear appropriate clothing, including closed-toe shoes and a helmet (both required). Fat-tired bicycles have cropped up all over Sisters Country. Where did these all-weather, all-terrain bikes come from? Reports of bicycles traveling over the surface of frozen rivers during the gold rush in Alaska date back to the late 1800s, but when bicycles were invited to race on trails groomed for the Iditarod sled dog race, a revolution in fat-tire bicycle design took off. The trail for the Iditarod sled-dog race covers a distance of over 1,000 miles from Anchorage to Nome. The first Iditarod race was launched in 1973, inspired by brave mushers who shuttled life-saving serum to Nome during a diphtheria outbreak in 1925, at a time before flights to Nome were possible. It was back in 1986 when Joe Reddington, considered the father of the Iditarod sled dog race, approached the mountain bike community to suggest they stage a long-distance mountain-bike race along trails that had been prepared for the sled-dog race. The first mountain-bike race, the Iditabike, took off in February of 1987, covering a distance of 200 miles from Big Lake, north of Anchorage to Skwentna and back, following a course across frozen lakes, swamps, clear-cut survey lines and along the Susitna and Yentna Rivers. The first race was won by Dave Zink in 33 hours and 50 minutes. All competitors rode on skinny mountain-bike tires, which forced cyclists to push their bikes on foot over long distances. The finish time also reflected the concern that such long distance events were pushing beyond human limits of endurance, so a six-hour mandatory layover was required at the half-way checkpoint. In 1989, race organizer Dan Bull, along with Mark Frise, Roger Cowels and Les Matz, launched the first bike expedition along the 1,000-mile length of the Iditarod trail, reaching Nome in 21 days. Competitors soon experimented with custom-made bikes. Dave Ford of Girdwood, Alaska, combined two rims together so each wheel could be fitted with two tires. There was even the famous "Six Pack" bicycle, ridden by Roger Cowels in the mid 1990s, sporting three tires on each wheel. On hard snow, only the larger center tire contacted the ground. The other tires came into play when trail conditions softened. As one can imagine, the bike was very heavy and unwieldy. The first improvement available to all competitors came in the early 1990s with the advent of 44-mm wide Snowcat rims, developed by Simon Rakower of All-Weather Sports in Fairbanks, Alaska. The Snowcat rim was the widest rim that would fit within the frame of a standard mountain bike, and it allowed cyclists to lower tire pressures for a wider tire print without the tendency for pinch-flats to occur. Tire manufacturers soon developed bigger tires to use with the Snowcat rims, but were still confined within the standard frame of a mountain bike. In the late 1990s Ray Molina in New Mexico commissioned 82-mm wide rims to go with 3.5-inch wide tires, called the Chevron, or "Mexican Sand Tires." They were used on custom-made bicycles for a tour-guide business in deserts. Mark Gronewald and John Evingson, both from Alaska, visited the Interbike Trade Show in Las Vegas and saw Milona's creation. Immediately they both realized the potential for using such wheels on snow. By February of 2000 they worked together to design and build five lightweight bikes for competition. These bikes were very successful for a few years, but since the wheels were low in profile with two inner tubes per tire, it was almost impossible to lower the tire pressures and increase the size of the tire footprint when snow conditions were soft. The current fat-tire bike design arrived on the scene in 2005, when Surley Bikes released the Pugsley frame for worldwide distribution. The immediate popularity of the Surley bikes soon brought other manufacturers to the market. The current wide fat-tire design on these bikes, with one inner tube per wheel, allows riders to lower tire pressures for a large tire footprint in soft snow. Long-distance races in the snow continued to evolve. Race organizer Dan Bull combined all the human-powered race disciplines into one race and the Iditasport was born. At the starting line competitors were asked to declare their "weapon." Were they using a bicycle, just their feet (on foot or snowshoes) or using skis? For a while there was even a triathlon division. The combined event turned out to be very successful and exciting formula. There were races within races, and with hard-packed trail conditions cyclist usually won overall. With softer trail conditions skiers had the advantage. 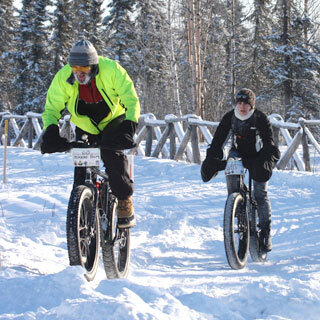 With time Iditasport has given way to other events along the Iditarod Trail. The Susitna 100 now offers 50-kilometer and 100-mile races. The Iditarod Invitational offers its 350-mile race from the Anchorage area to McGrath, and competitors who successfully complete this "short" race are eligible to race the full 1,000 miles to Nome the following year. Fat-tire bicycles have become hugely popular in Alaska, and large numbers of multiple-sport human-powered races are now offered all over the state, and they are spreading to the Lower 48. To stage these races a cooperative working relationship between fat-tired mountain bikes and snowmobiles is needed, so trails can be packed and competitors can be supported by snowmobiles during the events. In Sisters Country, fat-tire competition is also taking off. Blazin Saddles and Black Butte Ranch will stage the Cow Patty Crit #2 on Saturday, February 7, starting at noon. Even sooner on the calendar is the Desert Orthopedics Great Nordeen 15-kilometer fat-tire race on January 31, starting at 9 a.m. from Sunrise Lodge at Mt. Bachelor and descending to Wanoga Snow Park. The fat-tire popularity is now widespread all over the world. In Antarctica, during the 2013/2014 season, Maria Leijerstam became the first to ride a fat-tire tricycle to the South Pole. Shortly thereafter Daniel P. Burton rode a regular fat-tire bicycle to the pole. Fat-tire bikes are also becoming very popular for recreational riding. Many trails can be ridden safely in the fall, winter and spring seasons, when skinny mountains bike tires would damage trails. On the soft, sandy high-desert areas east of Sisters, fat-tire bikes can also ride without bogging down. Bjarne Holm moved to Sisters a year and a half ago after living in Alaska for 43 years. For close to three decades he has participated in and helped organize long-distance winter cycling competition in Alaska. Holm is a professional geologist, and for 22 years he also taught science and math in secondary schools. He is now a board member of the Sisters Trails Alliance.